OS X 10.9 Mavericks is out and it’s full of new features, including improved multi-monitor support. But it still doesn’t provide a quick way to change screen resolutions—you’d think that after a few generations of Retina MacBook Pro laptops, Apple would bring back a way to switch resolutions from the menu bar. Of course, third-party developers have come to the rescue. The latest, Bright Vertex, offers EasyRes 1.0.4 (Mac App Store link), which joins Eye-Friendly, Pupil, QuickRes, and ResolutionTab in the resolution-switcher fray. Fortunately for EasyRes, it has one feature that makes it stand out from the crowd. That feature is an immediately useful one: EasyRes provides animated previews of the available settings. Move the pointer over a screen resolution, and EasyRes shows how open windows would be affected by choosing that setting. So if you mouse over a lower resolution than the one you’re currently using—for example, if you mouse over the “1440 x 900” setting while your screen is set at 1920-by-1200 pixels—EasyRes shows a small, animated preview of how your screen will be affected by such a resolution switch. Even better, the animation isn’t generic—it shows what’s on your screen, so you can actually see how your on-screen items will fill the screen at the new resolution. The animation loops as long as you keep the pointer over the setting, and as you move the pointer over each possible resolution, the preview dynamically changes to reflect that resolution. Thanks to this animation, you no longer have to actually change resolutions, multiple times, to find the one that best fits what you’re doing. Developers testing Retina-friendly apps will find these previews especially helpful. When you mouse over a resolution setting, EasyRes shows an animated preview of how your display will be affected. Unlike some of the other resolution-switching apps I’ve reviewed, however, EasyRes doesn’t have many customization options. For example, though EasyRes does allow you to give custom labels to resolution settings, there’s no way to edit the list of available resolutions—“740 x 450” is always there, whether you use it or not. One workaround here is to use EasyRes’s listing of recently used resolutions: You can have up to ten recently used resolutions appear at the top of EasyRes’s list. EasyRes lets you give each resolution setting a custom label. 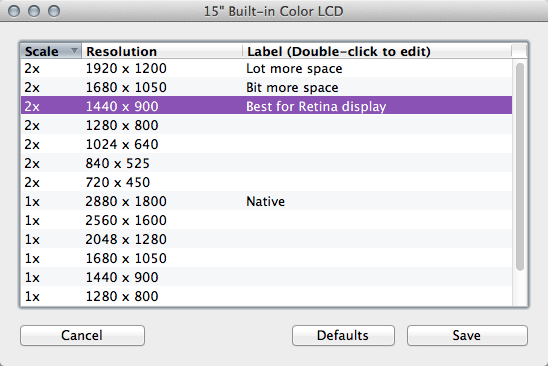 For a 15-inch Retina MacBook Pro, EasyRes provides 15 resolution settings, the highest being the screen’s native 2880-by-1800-pixel resolution. The QuickRes and Pupil utilities allow you to choose resolutions higher than the native resolution, such as 3840-by-2400. If you need to switch resolutions frequently, EasyRes’s previews may help you switch a little less often. This feature alone makes it well worth its $8 price. 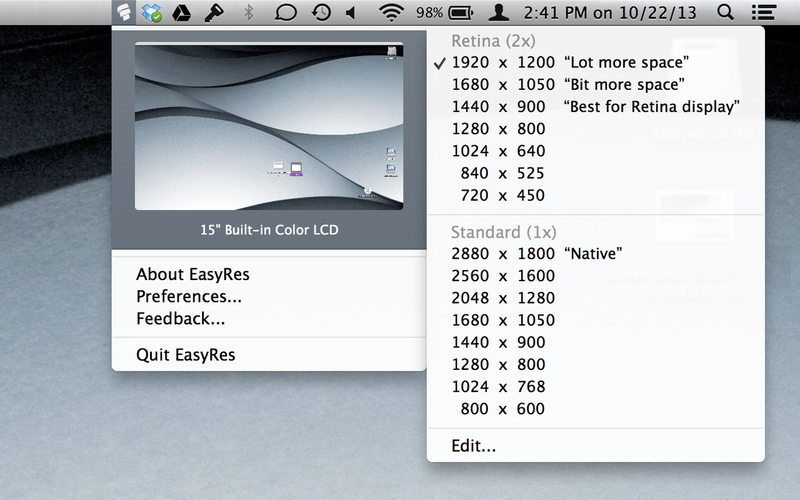 EasyRes is a nifty menu-bar utility for switching screen resolutions. 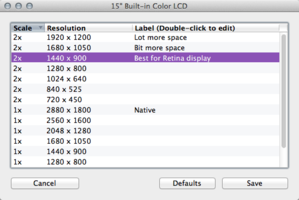 Its standout feature is previewing how a resolution change will affect your screen.